In this post, I will make a statistical presentation of the players of Berekum Arsenal FC. I will only present a player when I can document (or substantiate) that the player has featured for the club during the GLO Premier League 2010-2011. Berekum Arsenal FC became number ten in the GLO Premier League 2010-2011. Personally, I have always thought of Berekum Arsenal FC as a well-run club, able to produce exciting talents but who often kick-starts the careers of more established players. Berekum Arsenal FC is based in Berekum, located in the Brong-Ahafo Region in mid-western Ghana. Last season, Berekum Arsenal FC played some matches in the old away-shirt of Arsenal FC, which were criticized by some local football experts. The players are presented in alphabetical order. Please note that the opinions are merely subjective and that the statistical information could include some errors. All birthdates can be documented by references to reliable sources. The picture shows players of the club and is taken from xfmnewscenter.com. League matches in 2010-2011: unknown, but an important member of the team. Acheampong is described as an “energetic centre-back with amazing work rate”. * Adams is an unknown player to me. He is apparently a former player of West Ham United FC and Hikari FC, both amateur clubs in Ghana. League matches in 2010-2011: unknown, most likely a fringe player. * Adarkwa was part of the Ghana U-17 national football team during the 2005 FIFA World Cup in Peru. Adarkwa made only one substitute appearance. He has yet to break through at top level of Ghanaian league football. * The burly striker, kindly referred to as “Mboma”, is perhaps at the peak of his career, but the huge forward is nevertheless a true legend at Berekum Arsenal FC. Aggrey was Arsenal’s top goalscorer in 2009-2010 and he has basically been their star striker for many seasons. * Agyare, a giant centre-back, apparently 198 centimeters, was part of the Ghana B national football team in 2008. * According to Ghanasoccernet, Agyare will play for Hearts of Oak SC in 2011-2012. * Alhassan is an unknown player to me. League matches in 2010-2011: unknown, but a key member of the team. * Amankwah is an important veteran player, usually found in defence. He is at the same time an attacking force and he often takes the penalties for his club. * After an impressive 2009-2010 season, Amoah joined top club Asante Kotoko FC before the 2010-2011 season. Amoah failed to break through at Kotoko and as far as I know, he never featured for them in the league. Amoah was transfer listed by Kotoko in November 2010 and returned to Berekum Arsenal FC. * Anars became a household name in Ghanaian football after a brilliant second part of the 2007-2008 season for Hasaacas FC, scoring 13 league goals during the 13 last matches of the season. Anars joined Hearts of Oak SC for the 2008-2009 season and has not found his scoring form ever since. As far as I know, Anars was a rather peripheral player for Berekum Arsenal FC during 2010-2011 and in April 2011, Ghanasoccernet reported that Anars was suspended on disciplinary grounds. * Asare is an experienced goalkeeper who has been very consistent for the last couple of seasons. Asare is known for his good reflexes and is a very reliable goalkeeper. * Experienced attacker who rarely gets the headlines despite valuable efforts for his team. * A rather unknown left-back who I have impressed me during the season. A hard-working and disciplined player. * The confident right-back or central defender is a quality defender. According to my sources, Berko is 185 centimeters and 85 kilos. He is a former player of Zaytuna FC. *According to Ghanaweb, the burly defender will play for Medeama SC in 2011-2012. * Bonsu, a creative and hard-working midfielder, is arguably one of the best players at Arsenal. He is a former player of Royal Knights FC and is apparently 180 centimeters and 60 kg. Bonsu is very comfortable on the ball and has been part of the Ghana B national football team during the season. * According to Ghanasoccernet, Hearts of Oak SC has “secured the first right to buy… Richard [Osei] Bonsu who is currently on trials with an unnamed Egyptian club”. * Experienced, but rather unknown, attacker. * According to Daily Guide, Gyamfi is an intelligent, disciplined and robust defender with good ball control. He has apparently struggled with injuries during the season. Personally, I have no information about this player, who is also known as “Prince Kwadwo Gyamfi” or “Prince Kwaku Gyamfi”. Apparently, Gyamfi can also play as a midfielder. * Hard-working defensive midfielder who I was impressed with when I saw him play earlier this season. League matches in 2010-2011: unknown. * I believe this talented youngster is a midfielder. He is apparently a former player of Berekum Chelsea FC and Ebony International FC. * Highly regarded attacker who needs to score more goals. * Tall, hard-working left-winger who is very important in the offensive play of Arsenal. From my point of view, Ofori one of the most interesting players at the club. * There seem to be some confusion regarding the age of Ofori. The birthdate 10.03.1989 is taken from the Ghana Football Association but most other sources will tell you that Ofori is born 10.03.1993. Ofori is a former player of Barcelona FC Nungua and Berekum Chelsea FC. * Veteran goalkeeper who had many great seasons at King Faisal Babes. * Oppong was part of the Ghana U-20 national football team in January 2011. He is an unknown to me but is obviously a talented player. * Playmaker Ouattara is from Burkina Faso and his full name is El Hadj Moumouni Ouattara. I have read some rave reviews about this player during the season. Ouattara has blending skills and lots of creativity. * Pele is sometimes referred to as “Collins Pele Adjei”. * Arguably the star player of the season for Arsenal. Poku is a burly striker who is able to create chances on his own. At times he has almost been a one-man attack. Poku is hard working, mobile and built like a rock. * Poku joined league champions and city rivals Berekum Chelsea FC after the season. However, according to fresh reports, Poku signed for Egyptian side El Ittihad El Sakndary in August 2011. * A great goalkeeper who was been fighting hard with Thomas Tuah Asare for the number one shirt. Apparently, Razak will play for Ebusua Dwarfs in 2011-2012. * Wahab is an unknown player to me. League matches in 2010-2011: unknown, but an important member of the team until he left Arsenal in January 2011. * Yakubu is a rock-solid defender who has been captaining Arsenal for several seasons. Therefore, I was a bit surprised to learn that Yakubu left the club in January 2011 and joined Ebusua Dwarfs. Nevertheless, the experienced strongman is a legend at Berekum Arsenal FC. * Yakubu, a tall midfield maestro with good technique, is a very good player, but he failed to break through at Chelsea and joined city rivals Arsenal during the season. In April 2011, Ghanasoccernet reported that Yakubu was suspended on disciplinary grounds. * Yakubu is born in 1987 or 1988. * Yakubu will play for ambitious Medeama SC in 2011-2012. * A player called “Prince Antwi” featured for Berekum Arsenal FC during the second part of the season. I am pretty sure, but not certain, that this is the former player of King Faisal Babes, AshantiGold SC and Hasaacas FC, born 17.06.1986, and a former member of the Ghana U-23 and Ghana U-20 national football team. 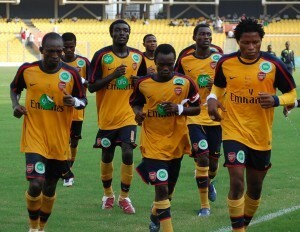 * Please note that the scorer in the match between AshantiGold SC and Berekum Arsenal FC on 31.10.2011 is still unknown. The match ended 1-1.